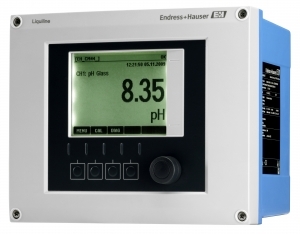 Endress+Hauser's Liquiline CM44 Series multichannel transmitter for monitoring and controlling processes in water and wastewater, chemical, power and other industries. CM44 models accept inputs from up to eight Endress+Hauser Memosens digital analytical sensors including nitrate, spectral absorption coefficient (SAC), pH, ORP, conductivity, oxygen, turbidity and ion selective electrode sensors. Memosens sensors are lab-calibrated devices that simply plug into the CM44 via an M12 connector. The CM44 can be field-upgraded from two to four or four to eight sensors simply by plugging in new modules. Optional current inputs are available for processing signals from other process devices such as flow, level or pressure sensors. Outputs from the CM44 include up to eight 4-20mA current outputs with HART; as well as Ethernet, Profibus, and Modbus TCP or 485 networks. An integrated web server provides remote access via any web browser. Additional outputs include up to four relay outputs capable of switching 24, 115 or 230Vac. The relay outputs can be used to sound alarms, start or stop cleaning functions, activate a controller, or perform other related functions. The web server connects to the Internet via the CM44’s Ethernet TCP port. Using any web browser, users can perform remote configuration or access to device parameters. * Redundancy for monitoring two or three measuring sensors. * rH calculation based on the measured values of pH and ORP sensors. * Displayed in user-defined menus. The CM44 has a back-lit graphic display that alerts users to errors and displays load curves. It also has drop-down menus for monitoring values, and displays outputs from the built-in data logger. The data logger can maintain up to eight separate data logbooks, with 150,000 entries per logbook. The data logger has an adjustable scan time of one second to six hours, and a logbook that keeps track of up to 75 calibrations. The CM44 has a rugged plastic IP66/67 housing that is leak proof and corrosion-resistant, making it ideal for use in non-hazardous applications in water and wastewater, oil and gas, chemical and power industries.